Dustin Shillcox (right) with researcher Claudia Angeli. Shillcox has relearned how to stand using an experimental treatment from Angeli called spinal cord epidural stimulation. Greeted by silence, he noted that people normally don’t think about how they move. But Shillcox, 31, has had to consciously relearn how to stand. He lost movement from his chest down after a 2010 driving accident in which he was ejected 80 feet through his car window. Shillcox is using an experimental treatment called spinal cord epidural stimulation, which involves implanting an array of electrodes into his spine that are helping his brain learn how to walk again. The treatment is part of the growing field of regenerative medicine, which also includes stem cell transplants, gene editing and other experimental techniques to essentially undo the damage caused by aging or injury. While much of the research still is early stage and being done in animals, some, like spinal cord epidural stimulation, already are being tested in people like Shillcox. “Some venture capitalists are investing in long-term projects that have a specific regenerative medicine focus,” said Dr. Thomas Rando of Stanford University School of Medicine in Palo Alto, Calif. 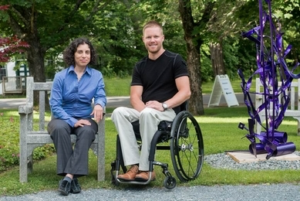 He was among a group of regenerative medicine researchers at the REGEN2015 meeting from June 26-28 at the MDI Biological Laboratory in Bar Harbor. The lab specializes in regenerative medicine. “I think regenerative medicine has a great future in therapeutic development,” added Eric Olson, Ph.D., professor of molecular biology at the University of Texas Southwestern Medical Center in Dallas. He also predicted that gene editing — where one letter of the complex genetic alphabet comprising DNA is changed to fix a mutation — will be used to treat a disease within a decade. Most of the researchers are working on basic animals, like worms, zebrafish and mice, to first find out how they are able to regrow severed limbs and heal from severe wounds. Humans also are believed to have such recovery mechanisms in their bodies, but so far they only work in organs like the liver and certain kidney tubules. MDIBL itself in 2013 launched the first company in its 115-year history, Novo Biosciences Inc., to study an experimental drug that has been shown to double the regrowth rate of tissue after amputation using a zebrafish.The company is studying the drug in other animals to see its effect on damaged heart tissue, with the hope of one day using it in humans. And while regenerative medicine still is in its early stages, it gives hope to patients like Shillcox. He said the stimulator, which he turns on and off by remote control, and can use only four hours a day, not only helped him to stand using a walker. It also helped regulate his blood pressure, increase his lung capacity and rebuild the muscle mass he lost from sitting all day. So far, four patients have received the implant at the Kentucky Spinal Cord Injury Research Center, said Claudia Angeli, Ph.D., an assistant professor at the center. She said she intends to use the implant in four more patients, three of whom have already been selected for the experimental treatment. The implant stimulates the spine, but researchers think that the brain may be reacting to visual and sound cues and actually building new nerve pathways around the damaged spine to the legs. The more the patient practices moving his or her legs, the better the movement. Angeli said the hope is one day to have the procedure used more widely outside of an experimental setting. But she and her colleagues still are looking at the optimum configuration of the electrodes for each specific patient.